this is the end... for the neon red !!! do you know anything about MIMP bootlegs? i don't know a lot of things about mimp bootlegs... i've 2 strange mimp in my collection : a little hard plastic vampiress, and a little soft plastic yellow t rex... the t rex has no point on his back. i'll try to post on this forum new photos of my collection soon. 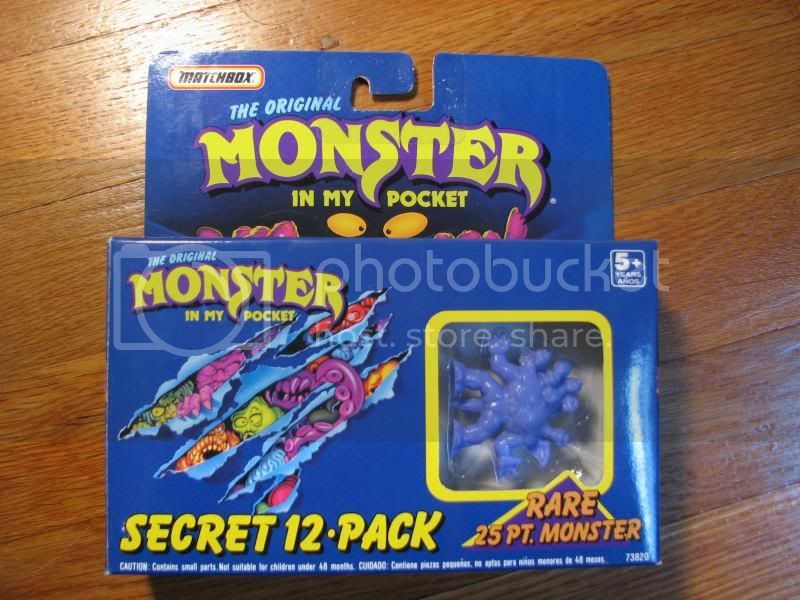 The one thing that I have so far that I think is really cool is a Secret 12-Pack with a packaging error. The Great Beast monster and his plastic are inserted sideways into the box. The box isnt sealed, but the plastic insert is still glued to the box with no signs of tears or removal so I know it hasnt been tampered with. Yes,I won't be able to take more pics until Tues. nite. Is the vampiress marked on the bottom and have a point value? i begin with the light purple ones ! Sorry guys, I missed this. I just used a piece of plain white paper that was taped both to the floor and to the side of a box. Hard to explain so when my wife gets home with her camera, I'll just take a photo of my setup to show how I photographed them. but with red and neon red. Folks who have never done any MIMP collecting may not have one or the other to compare so I thought it would be nice to have a photo like the one I posted above to help them out. I think the same should be done for yellow and neon yellow. The first 17 pages or so are all MIMP figures. I hope to have some more soon, as I just won some lots that include a Blemmea, a dark green Behemoth and a light blue Tengu and Mad Scientist. I also have to photograph my MIMP board game but I'm waiting to do that. I won another one the other night and want to see which one is in better condition before I shoot any pics. I will try to get my email to work so that everyone who wants photos can have them as files and not linked off of my photobucket site. Dude, I'll totaly trade you for a Dark Green/Pine Spring Heeled Jack if you get one. I'm REALLY trying to bolster my collection of that color. So far I have a Windigo, Tengu and a Skeleton (thanks Dark Clown). I also have that Behemoth on the way. I was trying to get a guy on eBay to break up a lot that he had up for buy it now, which had a pine hobgoblin in it. He didnt want to break up the lot and I didnt want to pay 40 bucks for one figure so I ended up not getting it. Ah well, there is always next time. 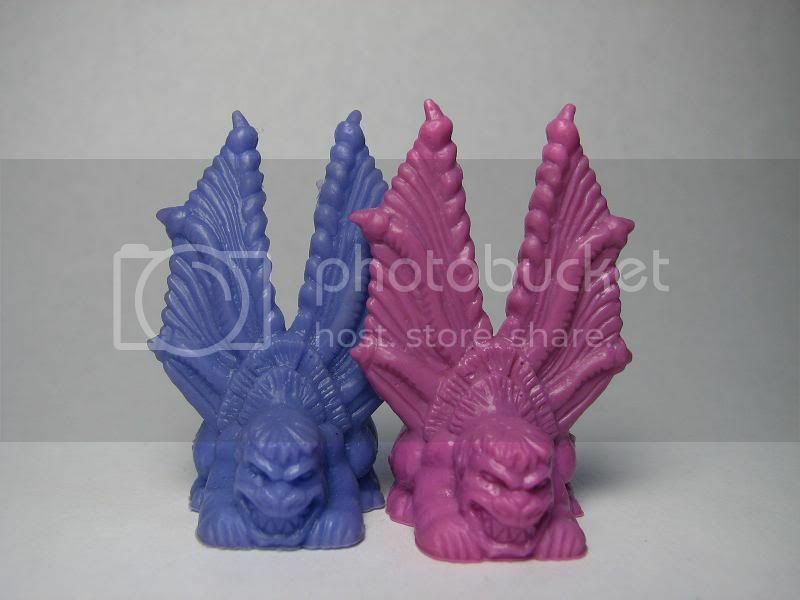 I have for trade a cyan Behemoth, an orange Triton and a pink Kraken. Plus a ton of non-premium figures. for the moment i post the old photos i've taken a while ago, because they are on my computer. but i'll take photos like you need, with the 2 colors like you asked. Edited by trumanshower, 05 December 2007 - 01:32 PM. Is that blue/purple werewolf mexican/italian??? Ahhh was you who outbid me on the pine skeleton and orange ghoul huh? Edited by Aikola, 05 December 2007 - 03:45 PM. I know that Werewolf also came in neon orange as well. I used to have one. Yeah, I know, thats what I'm saying. I was just adding that it also came in neon orange, which isnt pictured. Did you have to tell me now i have more to collect. Hahahah, yeah I did. Sorry bout that. What is your eBay name anyway? If I had known it was you I probably wouldnt have bid against you. But then again, I LOVE those pine figures so I may have anyway, hahah I try not to bid against fellow LRGers unless its something that I really, really want. I'm cool like that. 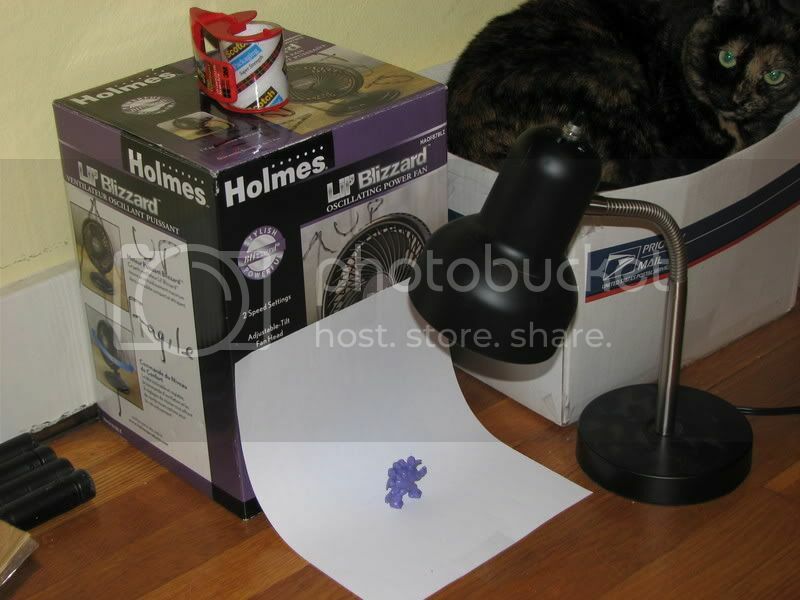 Here are the pics of the setup I use to get my awesome photos of my MIMPs. Its easy really. 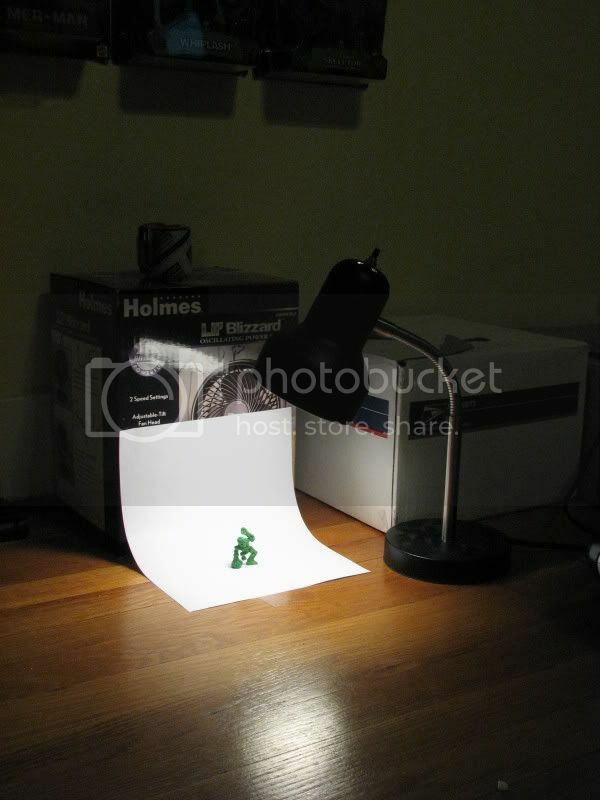 Just some tape and some white printer paper. Just make sure that the light is almost directly overhead and just a tad bit in front of the figure to get rid of shadow. Again, I have to give credit to my wife Abby for actually taking the pics. When the DB is done, she will have to be added to the liner notes for all the photos I made her take. Especially since she could give two $h!ts about toys. P.S. In the first photo you can tell that my cat Tromm really loves my toys. If only for the boxes they come in and the comfort those boxes afford. Edited by asator, 05 December 2007 - 07:38 PM. Never thought of that one.I will do some shooting when I have some time but deffinently before this month is over. Thanks Enio! The idea came from all the years of school pictures I had taken. They did the exact same thing but with a bigger canvas that was blue instead of white. I thought of that and came up with this setup. It works really well especially since white helps light up all the angles of the figures. I have 2 ebay names kenny500_00 is one and markhelen86 is the other. i have bought a load of stuff recently i have a shedload of swaps tho ill list them up soon. 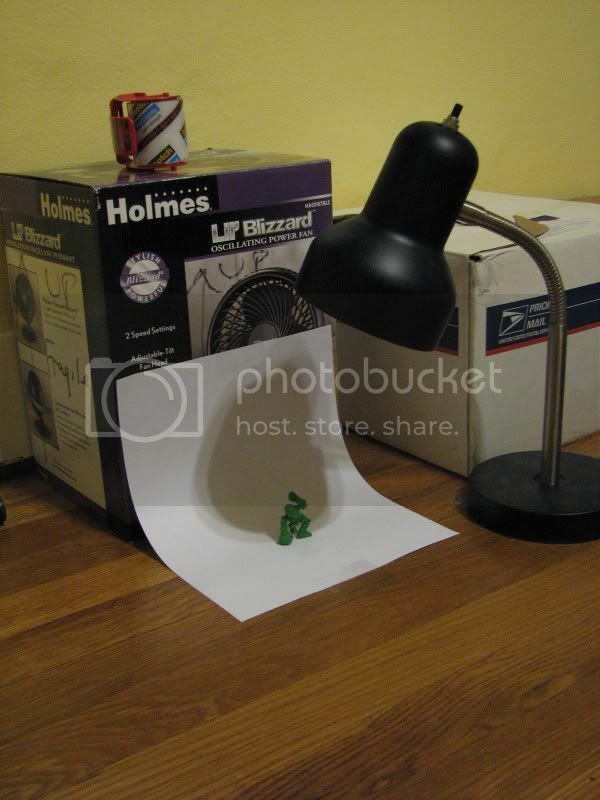 that setup is sweet ill see if i can recreate it. Edited by trumanshower, 06 December 2007 - 03:51 PM.